Those are the words on Thursday's front page of the New York Daily News in regards to the mass shooting that took place in San Bernardino, California on Wednesday. Around the paper's bold headline are images of politicians like Ted Cruz, Rand Paul, Lindsey Graham, and Paul Ryan, who in tweets are offering their prayers following the killings. "As latest batch of innocent Americans are left lying in pools of blood, cowards who could truly end gun scourge continue to hide behind meaningless platitudes," the paper writes under its headline. The front page was met with both agreement and anger when it was tweeted out as a preview on Wednesday night. Some users found the cover to be "brilliant" while others called it "deplorable." One of those was Rand Paul, who was included on the front page. "This @NYDailyNews cover is deplorable," Paul tweeted on Thursday. "Genuine thoughts and prayers are not political fodder." Brent Bozell, the president the conservative advocacy group Media Research Center, also slammed the paper's cover calling it "offensive and disgraceful." The Daily News' Editor-in-Chief Jim Rich responded to the criticism. "The Daily News front page is not, in any way, shape or form, condemning prayer or religion," Rich said in a statement. "Anyone suggesting otherwise is either — intentionally or unintentionally — misconstruing the point, which is that most GOP politicians have offered nothing but empty platitudes and angry rhetoric in response to the ongoing plague of gun violence in our country." "@NYDailyNews, not pulling any punches," tweeted Liz Heron, the executive editor of the Huffington Post. This isn't the first time that the New York-based newspaper has created public discourse regarding gun control with a front page that some found to be controversial. Following the murders of WDBJ reporters Alison Parker and Adam Ward in August, the Daily News produced a front page that included images from the perspective of the gunman at the moment that Parker was shot and killed. At the time, some felt the paper went too far but the Daily News stood by its decision saying that the brutal images were "a definitive part of the story." "We feel passionate about strengthening gun control, imploring politicians to improve mental health services, and highlighting the extraordinary scale of daily gun violence... That's why we published the images," the Daily News wrote in a note to readers in August. 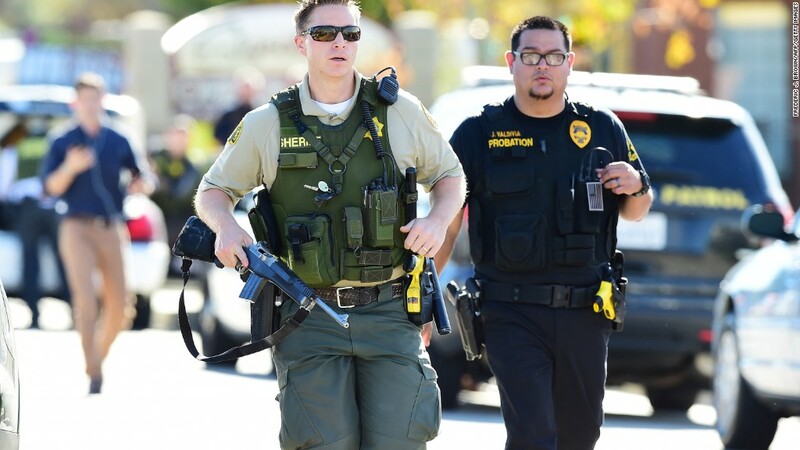 The shooting that took place on Wednesday at a San Bernardino center for people with developmental disabilities has left 14 dead and 17 wounded.